Orphaned Land are an Israeli progressive metal band formed in 1991. 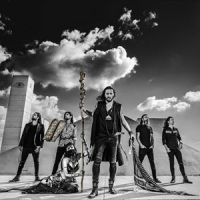 They combine progressive, doom and death metal as well as Middle-Eastern folk music and Arabic traditions in a form of Oriental metal. Their releases include Sahara (1994), El Norra Alila (1996), Mabool (2004), The Never Ending Way of ORWarriOR (2010), All is One (2013) and 2018's: Unsung Prophets & Dead Messiahs.